Car Hire Excess Insurance - Review Don't Renew! Did you take out an annual car hire excess insurance last year? If so, it is likely you will receive an email inviting you to renew your policy with the same insurer. What might at a glance seem an attractive renewal offer, can quite often be bettered by using the MoneyMaxim comparison service. But did you know that through MoneyMaxim your quote could be even cheaper? In this example, the renewal offer is £39.99. A new customer direct with the company would be offered the same policy for £42.99. But with MoneyMaxim it is just £37.25! Price is not the only reason to review your car hire excess insurance policy. Your requirements may change - Perhaps you are travelling further afield this year and need a worldwide policy in place of European? Or the opposite applies and you could save money by trimming the cover you buy - maybe European rather than Worldwide? Policy cover changes - You may find a different provider offers a policy with broader cover compared to your current insurer. Do you still need an annual policy? Yes - Bear in mind that automatically renewing your policy could mean your start date is weeks before your first trip. By taking out a new policy you can time the start of your insurance for your holiday dates and get a full years cover from that date. No - A single trip can work out cheaper, particularly for those hiring for less than 16 or 17days in a year. 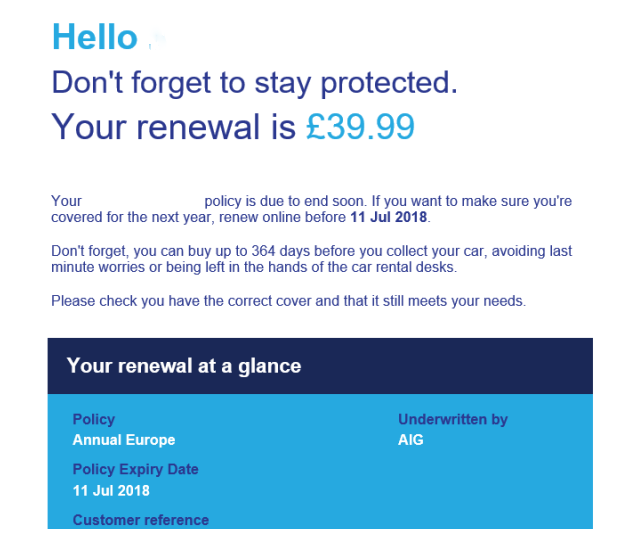 They will contact you before your renewal date which will be a timely reminder to review your car hire excess insurance needs. Icarhireinsurance give the choice of opting in to automatic renewals at time of purchase. If you would like to discuss your requirements do not hesitate to call us at MoneyMaxim - we are here to help!